In an earlier post, we discussed how crown procedures aren’t happening as much. Are Americans trending toward having healthier teeth? Probably not, especially with sugar consumption on the rise. The DentistryIQ.com article we referenced in the previous post posited that dentists may need to work on their case presentation skills; patients probably still have a need for crowns, but dentists may not be looking at preventative scenarios for patients who aren’t experiencing tooth pain (yet). With that in mind, we wanted to take a deep dive into dental crown procedures, and cover the uses and the types, as well as other pertinent information. First off, let’s define what a dental crown is: a crown is a “cap” customized to cover a patient’s tooth. Typically, this procedure serves to restore a tooth’s shape and size, increase its strength, or enhance performance. In a successful procedure, the crown is cemented into place, perfectly encasing the tooth for full protection. Crowns can also be used in pediatric dentistry; for example, if baby teeth have been damaged by decay, in extreme scenarios where poor oral hygiene or an aversion to general anesthesia demands the procedure, a crown might be appropriate. Temporary: Temporary crowns can be made right in your dentist's office to give a tooth coverage, while the permanent crown is made off-site, typically in a dental laboratory. Temporary crowns are often made of acrylic-based material or stainless steel. Stainless Steel: Stainless steel crowns are typically a temporary solution used to protect a tooth or filling while a permanent crown (made from a different material) is being prepared. Stainless steel crowns are often used for children to protect a primary tooth from additional decay—that way, when the permanent tooth arrives, the crown comes out naturally. Metals: Metal crowns normally include alloys with a high gold/platinum content, or base-metal alloys like cobalt-chromium and nickel-chromium. These alloys can endure the wear and tear of long-term biting and chewing, and are considered very durable since they rarely chip or break. The color is the main disadvantage, which is why they’re often used for molars near the back of the mouth. Porcelain-Fused-to-Metal: This type of crown is a solid option for front or back teeth, or when a bridge demands the strength provided by the metal. The advantage of the porcelain is appearance; the color can be matched to neighboring teeth. However, porcelain does have its disadvantages: it shows more wear, can chip or break off, and over time a dark metal “line” can show through. All-Resin: While dental crowns made entirely from resin are not as expensive as other crown types, over the long term, they do have the tendency to wear down or fracture at a higher rate than porcelain-fused-to-metal crowns do. All-Ceramic or All-Porcelain: Easily considered the best cosmetic choice, these dental crowns provide a natural color match that’s far better than any of the other materials, and they’re definitely more suitable for patients with any metal allergies. When a tooth has become irreparably decayed or infected, a dentist will typically recommend a root canal. Once the root canal is completed, a crown will be utilized to restore strength to the weakened tooth. If a tooth is damaged or discolored, its appearance can be enhanced with a porcelain or ceramic crown. If a patient has an ugly filling, a crown can be used to cover it up, too. Cracked teeth often demand a crown since the structure of the tooth is at risk. Due to increased sensitivity, a cracked tooth can be very painful, so a crown offers relief, all while making the tooth much stronger. Think of a dental implant as a replacement for a tooth missing its roots. In this case, a crown can replace the missing tooth. Once the dental implant is placed into the jawbone, the crown covers the top of the implant, allowing the patient to chew normally. The crown is part of a permanent restoration. The bulk of the dental work is done during the initial appointment. After the tooth is numbed, it must be shaped, where some of the tooth structure must be “trimmed” away. Typically, for front teeth, 63% to 73% of the teeth are trimmed away, while the range is 67% to 75% for the back teeth. Each patient’s individual scenario, along with the type of dental crown, will dictate how much of the tooth structure needs to be trimmed, so that the crown can easily be slipped on top of it. While cement will ultimately hold the crown in place, only the proper shape will provide long-term strength and stability. Once the shape is ideal, the next step is to take an impression of the tooth—this is what allows for a perfect crown fit. The tooth is washed and dried; afterwards, a retraction cord is tucked around the tooth to push the gums back. That way the impression material will provide an accurate representation of the tooth. Next, the impression material is placed over the tooth, and the impression tray is pushed down over the tooth (as well as the adjacent teeth) until it melds into one unit. Upon removal, the impression has solidified, offering a copy of the tooth that requires the crown. A “bite impression” is also taken to ensure that the patient’s teeth come together properly for optimal biting and chewing. Modern advancements allow for optical impressions, which some dentists now prefer. This allows the dentist to send a digital impression to the lab instead of a physical one. Before placing a temporary crown on the tooth, a color match is made. Then the impression is off to the lab, where they make a plaster cast that is used to create the new crown. This can take one to two weeks. This is also known as the “crown placement” appointment, and is not as involved as the initial appointment. Once the tooth is anesthetized, the temporary crown is removed. The crown will be placed on the tooth to gauge the fit and check the appearance. 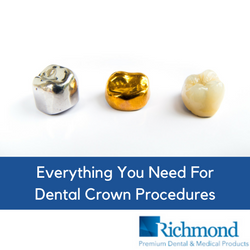 To ensure an ideal fit, the crown may be removed and adjusted multiple times. Once that perfect fit is determined, the crown will be permanently cemented into place. The patient will bite down, often on cotton gauze or a nonwoven sponge until the cement is set. The final step for crown placement is scraping away the excess cement around the tooth. Most of the post-procedure care tips are fairly obvious: avoid hard or chewy foods—like ice or candy—that have the potential to damage your crown. If you’re in the habit of clenching or grinding your teeth, most dentists will advise patients to wear a mouth guard at night to offer protection. Over time, repeated grinding will wear down a crown (or teeth in general). Keep in mind that standard oral care, like consistent brushing and flossing, will prevent decay and gum disease for the affected tooth. The care tips mentioned above are critical for the long-term care of a crown. However, the fit of the crown goes a long way toward its longevity. When done properly, a crown provides strength and stability, protecting the tooth underneath. If a crown is a poor fit, bacteria build-up can cause tooth decay over time. Beforehand, a dentist will also evaluate the gums and supporting bone structure to make sure the tissue beneath is healthy. The ultimate goal is to protect the tooth, and reduce the chance of gum recession, which would expose what’s called the “crown margin.” If a crown is fit properly by the dentist, and cared for appropriately by the patient, it should last 10-15 years. The cost of a dental crown varies. The price ranges from $1,000 to $3,500; however, each individual patient’s needs are unique. If a dental crown is not covered by an insurance policy—or if a patient doesn’t have insurance—third-party financing companies can be utilized to create a payment installment plan. While a crown procedure is time-consuming for a patient—since it spans two appointments—patients are often thankful since a crown relieves tooth pain and protects a damaged tooth. In the end, a dental professional can advise when and why a patient needs a crown, and which materials work best. If dental professionals continue to hone their presentation skills, making the case for crowns even if pain is absent, then it stands to reason that those downward-trending numbers will soon reverse course.